Heads were turned when Mid West Displays launched a stylish easel-style LED display frame at Sign Link Live earlier in the month. Aimed to create designer display glamour at an everyday price, the frame offers ‘Plug N Display’ technology – it needs no specialist installation, just plug into the nearest power supply to see the smart but sturdy LED light pocket frames power up with a bright but subtle light. The acrylic frames are available in a range of traditional and on-trend colours and offer a choice of A2 and A3 light frames in a range of configurations. 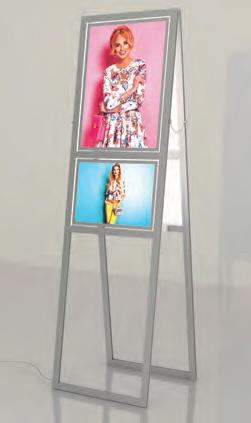 The Shrewsbury-based retail display specialists believe the lightweight yet durable frames offer the ultimate in display flexibility and are ideal for many locations such as fashion retail venues, hotels, bars & clubs, salons & exhibitions/trade shows.